Hotels for business travel, offering wi-fi and high speed internet connections, business centers, meeting and conference rooms, voicemail, work desks, as well as many other amenities for today's business / corporate traveler. 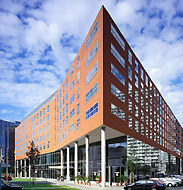 Find the perfect corporate hotels in Berlin by going directly to hotel websites. Check availability, amenities, and rates for business accommodations Berlin directly from each property. Situated near the Berlin Zoo and right in the midst of Berlin, Germany's world-famous boulevard Kurfurstendamm - otherwise known as ‘the Champs-Elysees of Berlin' - Warwick Hotel California exudes both the elegance of the past and the sophistication of the future. The hotel was founded at Kurfurstendamm 35 in 1984, though most of the building itself was erected some 90 years prior, completed in 1898. One of a few buildings that escaped destruction during the Second World War, it has now earned historical designation. The hotel was expanded in August 2008 to include the adjacent building at Kurfurstendamm 34. This modern architectural marvel remains a sight to behold with its clearly defined facade of dark natural stone, bronze-coloured aluminum trim and bay windows. The Steigenberger Hotel am Kanzleramt has its name from its uninhibited view of the German Chancellery (the 'Bundeskanzleramt') and the Reichstag Building. The new hotel in the centre of Berlin near the main station offers high-class comfort and is ideal for business travelers and city tourists. The restaurants and bars cater for almost every taste and in the fitness and wellness area you can also enjoy a magnificent view while exercising. Jogging and walking are possible along the Spreebogen, the bend in the river, with the Federal Press Beach and can be extended without any problem whatsoever to the Brandenburg Gate. With local public transport you can quickly and easily reach further highlights of the city. On historic Gendarmenmarkt the Hilton Berlin hotel is a stone's throw from the Konzerthaus and the French and German Cathedrals. Work out in the 24-hour gym dip in the pool and relax in a Thalasso spa. Try regional cuisine with a twist in the Mark Brandenburg restaurant or go tropical in the South Seas-themed Trader Vic's. The 3-star hotel is situated amidst green surrounds in the Berlin district of Reinickendorf. This design-oriented establishment offers excellent public transport connections, making it the ideal starting point from which to explore the German capital's diverse attractions.The Grand City Central Hotel Berlin Airport features newly-renovated rooms with oversized floral motifs in a variety of vibrant colours. A total of 135 beds are spread over 5 floors, available in the 5 single and 65 double rooms. The 70 newly-renovated rooms offer modern, elegant furnishings. A complimentary hotel car park, WLAN Internet access and a lobby lounge with a flat-screen television round off the amenities at this 3-star establishment.The Grand City Central Hotel Berlin Airport offers an all-you-can-eat breakfast buffet every morning from 06:00 to 10:00. This 2-star hotel is situated directly on Kurt-Schumacher-Platz, just 5 minutes away from Tegel Airport and conveniently connected to public transport.Located in the Berlin district of Reinickendorf, this hotel is the ideal starting point from which to explore the German capital. The modern, comfortable rooms invite guests to lean back and relax, all feature cable TV, telephone, safe and an exclusive marble bathroom.The hotel also offers a bright conference room featuring state-of-the-art conference equipment for functions with up to 35 persons.Each morning, from 06:30 to 10:30, the hotel puts on an extensive daily breakfast buffet, during which unlimited coffee, tea and fruit juices are available. The elegant Savoy Hotel Berlin is renowned for its personalized service, roof terrace and modern conference rooms. It is situated in one of the most beautiful and quiet streets of Berlin's famous Kurfuerstendamm, in the heart of the German capital. It was extensively renovated in 2006. Part of the WORLDHOTELS First Class Collection and winner of the 'Friendliest Service hotel award in 2002, it offers 125 sumptuous rooms over six storeys and boasts discrete, personalised service. Its exclusive cigar lounge, 'Casa del Habano' offers the finest Cuban cigars. As an elegant city hotel of international standard, the Savoy Berlin combines modern comfort with highly professional and refreshingly individual service. Guests of the Savoy Hotel Berlin are just a few minutes' stroll from the Bahnhof Zoo (west Berlin's main train station), outstanding shopping opportunities, as well as the fascinating Berlin Zoo and Aquarium, home to an astounding array of animal and aquatic life. The new parliament house of the Federal Republic of Germany, the Reichstag, is a 10-minute trip away. The charming, comfortable 3-star Grand City Hotel Berlin Zentrum is situated within a few paces of Kurfuerstendamm and offers an extraordinary setting: a historic façade followed by a foyer with unique wall paintings, a chandelier and magnificent stucco ceilings.59 comfortable, bright and friendly rooms are on offer in this old Berlin city palace. A buffet is available every morning in the inviting breakfast restaurant, providing hearty sustenance to kick-start an enjoyable day in the German capital.The lobby bar is a popular meeting point for all visitors to the metropolis on the River Spree - both for an afternoon coffee or a freshly-tapped beer in the evening. Those arriving by car may make use of the car park located in the hotel's inner courtyard (fees apply). Following a comprehensive modernisation in 2010, this famous, well known 4-star-lifestyle hotel, offers a top location in the charming metropolitan west of Berlin and is close to the musical venues, shops and the Berlin zoo.The hotel, with its 316 rooms and suites, is situated within just a few paces of the famous Kurfuerstendamm shopping street. The Zoologischer Garten, Europa Center, KaDeWe department store and renowned City West all lie within walking distance and the trade fair as well as both Tegel and Willi Brandt Schoenefeld/Berlin-Brandenburg-International airports may easily be reached via public transport.The modern designed Restaurant 'FRANKE Brasserie', with its open kitchen, is known for its unique style in the dining scene of Berlin, serving Innovative interpretations of traditional and international dishes the Tel Aviv cuisine style. Those arriving by car may make use of the on-site car park and underground garage parking. The Precise Myer’s Berlin is located within a few minutes of Alexanderplatz and the TV tower. An insider's tip: this boutique hotel is situated in the trendy Prenzlauer Berg district.The Precise Hotel Myer's Berlin is housed within a neoclassic building dating back to the 19th century. Fine wooden floors, high stucco ceilings, selected fabrics and wallpapers as well as tasteful furnishings create the sophisticated flair. Interesting contrasts are formed between the modern works of art as well as the conservatory, which serves as a restaurant-bar. At the heart of young, trendy Berlin, with its hip designer stores, theatres and galleries as well as countless bars, cafés and restaurants, the district fondly referred to as Prenzlberg by the locals counts among the most popular tourist areas in the metropolis on the River Spree. This 3-star hotel benefits from a quiet, yet central location. Comfortable rooms with WLAN Internet access, restaurant, bar, sauna and fitness area ensure all service and comfort requirements are accommodated.The sauna, solarium and fitness area may be enjoyed at no additional charge. Rooms for non-smokers and for guests with disabilities are available upon request.The lavish Ramada Hotel Globus Berlin restaurant serves a delicious selection of international dishes as well as a range of seasonal regional specialities. A bar and a summer garden are also available.The hotel's 5 air-conditioned conference rooms feature modern technical equipment and can be combined to accommodate up to 300 guests in a space covering approximately 280 square meters.Complimentary car and bus parking can be found in front of the hotel. The unique complex of the 3-star hotel in the northern city center is the inimitable mixture between art nouveau and a contemporary design in one of the most interesting hotspots of Berlin.75 newly renovated rooms demonstrate a bright and homely style including cozy and friendly amenities.The Restaurant offers a huge range of gastronomic highlights. An impressive hotel bar is connected to the restaurant and has glass-covered terrace for pleasant, romantic moments.Excellent connections to public transport make this hotel a perfect starting point for sightseeing throughout Berlin. Welcome to the Hotel California am Kurfurstendamm, your home in Berlin. We are well situated right on the Kurfurstendamm in the midst, Berlin's world-famous boulevard, in a building that combines history and design. For more than 25 years, we have been offering our guests rest and relaxation in comfortable and elegant surroundings. The big city, with its endless variety of restaurants and bars, theaters and cabarets, and international designer fashion shops, is right at your doorstep. This central yet peaceful 2-star hotel which features comfortable rooms, WLAN Internet access, an underground car park and a bar with a summer terrace, enables rapid access to Tegel Airport and the city centre.With its selection of 116 standard and twin rooms, the Ibis Hotel Berlin Airport Tegel guarantees a comfortable stay. The hotel offers an extensive range of amenities to accommodate both business and leisure travellers to the city: a car park and underground garage are available and there is also WLAN Internet access to take advantage of and a complimentary Internet terminal at the lobby. A varied selection of light snacks and refreshing beverages are on offer 24 hours a day from the bar, which also offers a summer terrace. The hotel has also 4 air-conditioned function rooms that can accommodate up to 80 people and are suitable for a range of event, meetings and conferences. The 3-star hotel features a restaurant, a bar, a bistro and a complementary gym and is centrally located in close proximity to Alexanderplatz and the Velodrom event-centre. Comprising modern, youthfully designed rooms, some of which have been entirely refitted, guests are guaranteed a good night's sleep.The 161 spacious, comfortable rooms (25 square meters) offer modern, 3-star comfort. The renovated superior rooms feature a fresh, clear-cut design. Selected rooms also contain with a kitchenette, making them ideal for extended stays.Training and sporting venues such as the Sportforum, Velodrom and Max-Schmeling-Halle are located in the near vicinity, making it the perfect stopover point for sports enthusiasts.The culinary offerings at the Grand City Hotel Berlin East are extremely diverse: whether in the Landsberger 203 with its Mediterranean specialities, the typical Berliner Bistro or the New Orleans Bar, a pleasant experience is guaranteed. In the summer months, an after-work beer on one of the 3 outdoor terraces is highly recommended.A complimentary fully-equipped fitness area is available daily.